(Note: This is different from the rooms of House of Big Brother at Manalo Street, Puerto Princesa City). This condo has two (2) big beds (48 inch-wide each) that can accommodate a maximum of 4 persons. It has windows and al-fresco veranda facing the surrounding trees behind the building. Equipped with aircon hot/cold shower, toilet bidet, 32 inch big LED cable TV, electronic safe, cabinet. Kitchenette with refrigerator, microwave oven, induction cooker, rice cooker, electric kettle and dining table and utensils. The bathroom has free body/hair liquid soap, toilet bidet and hot/cold shower. Free WIFI and filtered drinking water. This condo unit has two big beds (48 inch-wide each) that can accommodate a maximum of 4 persons. Equipped with aircon, hot/cold shower, toilet bidet, liquid bath soap, 32 inch big LED cable TV, electronic safe, cabinet, microwave oven, electric kettle and dining table and utensils. It has a huge window facing the atrium of the building. Free WIFI, liquid soap and filtered drinking water. This aircon condo unit is the largest and suitable for a big group or family. It has two (2) big beds (48 inch wide each) and one double deck bed with the lower deck having a big (48 inch wide) bed and the upper deck with a single bed (36 inch wide). It has a veranda with sliding glass window facing the main avenue and where the kitchenette is located equipped with refrigerator, microwave oven, induction cooker, rice cooker, electric kettle, dining table and utensils. Bathroom has toilet, bidet and hot/cold shower with automatic exhaust fan. There is also free liquid bath soap. Wifi and filtered drinking water is free. This condo unit has two big beds (48 inch-wide each) that can accommodate a maximum of 4 persons. Equipped with aircon, hot/cold shower, toilet bidet, LED cable TV, electronic safe, cabinet, microwave oven, electric kettle, dining table and utensils. It has a window facing the atrium of the building. WIFI and filtered drinking water is free. This condotel has two (2) big beds (48 inch-wide each) that can accommodate a maximum of 4 persons. It has windows and al-fresco veranda facing the surrounding trees behind the building. Equipped with aircon hot/cold shower, toilet bidet LED cable TV, electronic safe, cabinet. Kitchenette with refrigerator, microwave oven, induction cooker, rice cooker, electric kettle, dining table and utensils. The bathroom has free liquid body/hair soap, toilet bidet and hot/cold shower. WIFI and filtered drinking water is free. This condotel has two (2) big beds (48 inch-wide each) that can accommodate a maximum of 4 persons. It has windows and al-fresco veranda. Equipped with aircon hot/cold shower, toilet bidet LED cable TV, electronic safe, cabinet. Kitchenette with refrigerator, microwave oven, induction cooker, rice cooker, electric kettle, dining table and utensils. The bathroom has free liquid body/hair soap, toilet bidet and hot/cold shower. WIFI and filtered drinking water are free. This room faces Rizal Avenue. SET BREAKFAST MAYBE ORDERED IN ADVANCE AT ADDITIONAL RATE STARTING FROM PHP80 PER SET MEAL AND PROVIDED BY JOLLIBEE OR CHOWKING. ADDITIONAL SWIMMING/DIPPING POOL FEE COVERS TOWEL, LIGHTING, GUARD FEE COST. UNITED STATES DOLLAR EXCHANGE RATE IS AT 40 PHILIPPINE PESOS TO EVERY ONE UNITED STATES DOLLAR. AIRPORT TRANSPORT IS FROM AS LOW AS P10 PESOS PER PERSON IN A SEVEN MINUTES PUBLIC TRICYCLE RIDE TO P200 PER TRIP AIRCON SHUTTLE VAN FOR A MAXIMUM 6 PASSENGERS. *ALL ROOMS ARE NON-SMOKING AREAS EXCEPT THE VERANDA AREAS AND AN OPEN AIR COMMON SMOKING AREA. 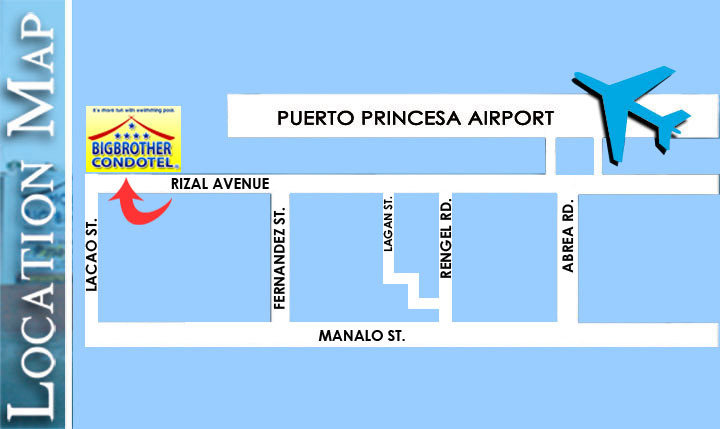 Airport to BigBrother Condotel is 7-10 minutes ride only along the same road as the airport terminal.